Tablet PCs can be defined as a fusion between older handheld PDA and laptops. This gives the user the best of both worlds with more portability and convenience at their fingertips. Tablets are lightweight and smaller but more functional, giving you everything you need and nothing you don't. 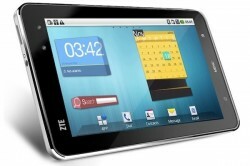 OneShop always list's the most popular Tablet PCs and the best prices. With our OS score you can see which Tablet is seen as the best performing. The tablet can be arguably defined as both portable computer -smaller than a laptop but with features similar to a full-size computer - or complete mobile computer with the characteristics of mobile phones or PDAs (personal digital assistant). Whatever the definition, that fact remains that the tablet PC will change the way we interact with the world. It's no secret that the tablet PC is growing in demand and popularity. Tablets can be operated primarily by touching the screen to relay commands to the interface, like the computer mouse, the users fingers act as a pointer to navigate the device via the operating system. Today's tablets use various external methods to communicate with its software; virtual keyboards, a stylus pen or a digital pen can be used rather than a conventional mouse and keyboard. The most popular open source software is Google's Andriod that has been intergrated and customized to suite current tablets for brands like Asus tablets, Samsung tablets and Blackberry tablets. In earlier years, tablet PCs were undeveloped notebook computers with not enough functionality to be considered as a standalone computing device. Tom Dimond and Alan Kay of the 1950s - 60s conceptualized the idea of the tablet with hand writing technology using a pen as output onto a computer system. Alan Kay's Dynabook was known to be the first tablet PC, targeted at a younger audience but no comercial success. Apple Computer developed the Newton tablet PC in the late 1980s with moderate appeal although the project was later cancelled due to high expense and low sales. With so many new tablets entering the market, consumers may get confused regarding the various types of tablet PCs available, lets look at the difference. Media tablets - Media, or multimedia, tablets are designed to be portable entertainment devices, bigger than a smartphone but smaller than a notebook. Media tablets like the andriod tablet PCs, Samsung Galaxy Tab and Apple iPad, have larger screens and improved audio and video codec's as well as a integrated graphics engine for gaming. Industrial tablets - Unlike media tablets, industrial tablets are mainly used by professionals that work in harsher tougher environments. An example of an industrial tablet is the range of semi Rugged or Rugged Mecer tablet PCs. Design to be sturdy and durable, industrial tablets are used for military, factory, warehousing, police and other outdoor or emergency services. Convertible tablets - Often considered as a alternative to a notebook or PDA, convertible tablets, like the Fujitsu Lifebook T1010, has a display that rotates 180 degrees and can swing over and close, face down, on the keyboard. Widely used in businesses and small offices, the convertible tablet can be used to display diagrams and graphics in "display mode" or simply used as a regular laptop computer. Hybrid tablets - These new tablets offer the best of both worlds. Hybrid tablets like the ASUS Eee Pad Transformer, has detachable keyboards or screen which can then be used as a independent tablet; basically a notebook with a touchscreen. If your looking for a desktop or notebook replacement, than a tablet PC is the best multimedia solution for work and play. Satisfy your entertainent needs by having all your favourite music, movies and games or practical work applications for the office on one device without carrying a bulky notebook around. OneShop will help you choose the best tablet by giving you custom reviews, latest tablet ratings and compare the tablet pc prices so you can make a informed decision for the best tablet pc and enjoy the tablet experience at your own leisure. The tablet PC has become an overwhelming "overnight" success. The hugely successful Apple iPad has set the bar as the most powerful and functional tablet of the past decade. Many other amazing tablets such as the Samsung Galaxy tab and Blackberry Playbook ahave entered the market giving you more options to choose from. See techtarget for definitions on "what is a tablet PC"?